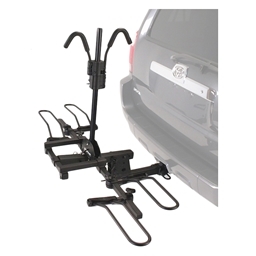 The SportRider SE2 hitch racks that will fit almost any style of bike using a padded universal top clamp and adjustable wheel holders. Simply drop the bike into the wheel holders, then slide the self locking clamp down onto the frame to secure the bike. The HR1450E is the electric bike version of the Sport Rider SE2 hitch rack. It will carry 2 electric bikes or standard bikes (up to 60"). Special features include extra heavy duty wheel holders and front support frame (see pictures below) for heavy load carrying capacity. The rack folds up when not in use, tilts down for easy cargo access and includes a keyed alike locking hitch pin and security cable. Features patented "no wobble-no tools" hitch tightening system. For 2" hitches only.